Designed to clean without harsh detergents and rinses easily and restores 'like new' look of leather. 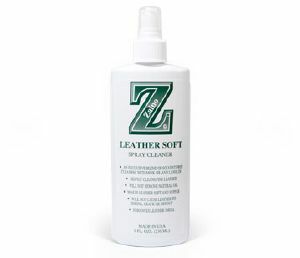 Z-9 Leather Soft Spray Cleaner contains the finest blend of emulsifiers, mink oil and synthetic lanolin to safely clean all fine leather surfaces. Alkaline and detergent-free, Z-9 Leather Soft Spray Cleaner gently lifts soil and stains without harming the dyes, clear coat protection or natural oils in leather. Z-9 Leather Soft Spray Cleaner is so gentle, it helps prevent premature leather damage, including cracking, shrinking and drying. Perfect for all leather products. Excellent for vinyl too. After cleaning with Z-9 Leather Soft Spray Cleaner, follow with Z-10 Leather in a Bottle™ to keep your leather interior soft, supple and smelling like new. Apply Z-9 one section at a time and work the solution into a nice lather with a sponge. If your leather is heavily soiled, use an upholstery (interior detailing) brush. When finished scrubbing, be sure to remove all cleaner from the surface with a damp towel. Do not use an excessive amount or allow cleaner to dry without wiping. Dry the leather with a clean, dry cotton towel. Allow your leather to dry thoroughly before applying Z-10.